While Clover and her whale friend are in Punta Cana, Pipkin and Domo are back in Vermont planning their trip to San Francisco. 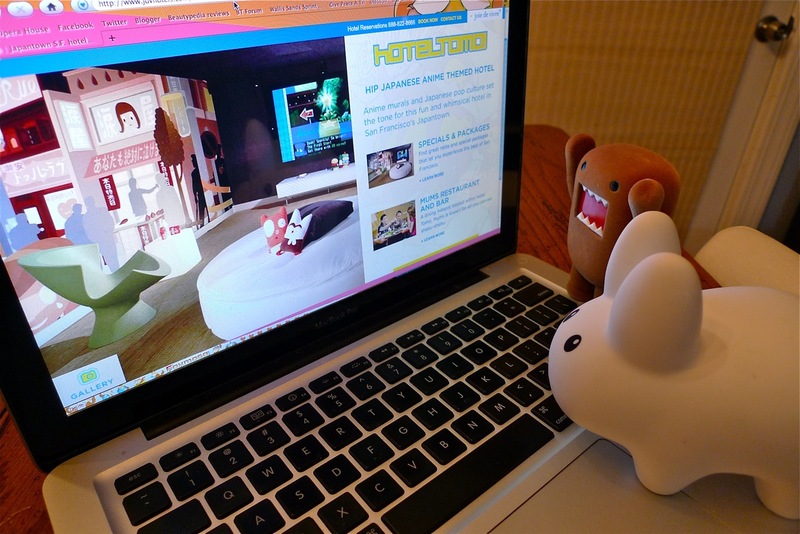 Pipkin found a cool hotel in Japantown called Hotel Tomo, which is a "hip Japanese anime themed hotel" with lots of cuteness and wall murals by artist Heisuke Kitazawa. The hotel even boasts a "Players Suite" with an 8x5 foot LCD HDTV so you can play games until your eyes bleed. Quite sure Captain Holly would get his game on in that room, but Pipkin and Domo don't want to hole up in a hotel the entire time, they want to explore the city! When their feet are weary from their travels they are sure to enjoy sprawling out on the comfy beds with the monster pillows. So excited, can't wait to go!